By the time I discovered there were turf quest rewards for 10x each resource building, I was already committed — this is a valid note to ponder for those of you who care. 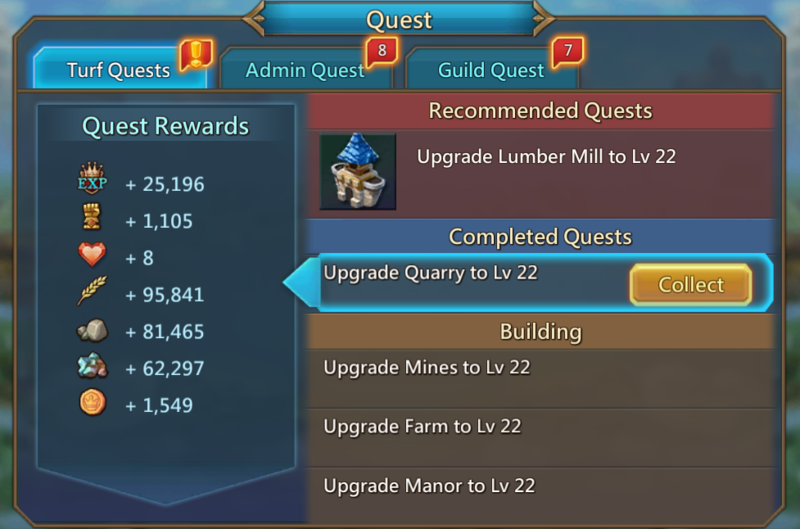 Should you decide to pursue this quest, build farms first; that way you can destroy them all, save one for upgrades (after a point, extra farms are just wasted space). You will need more wood than any other resource (excluding possibly gold), so if you build up your turf equally on the bottom, you might want to consider building more mills in any extra spaces. I would suggest building two barracks at the top of your turf to help with training speed, and an equal number of infirmaries and manors in the spots that remain. Upgrading your infirmaries as you build more troops (and ensuring you have more beds than heads) will save you weeks of rebuilding when you get caught with your pants down. 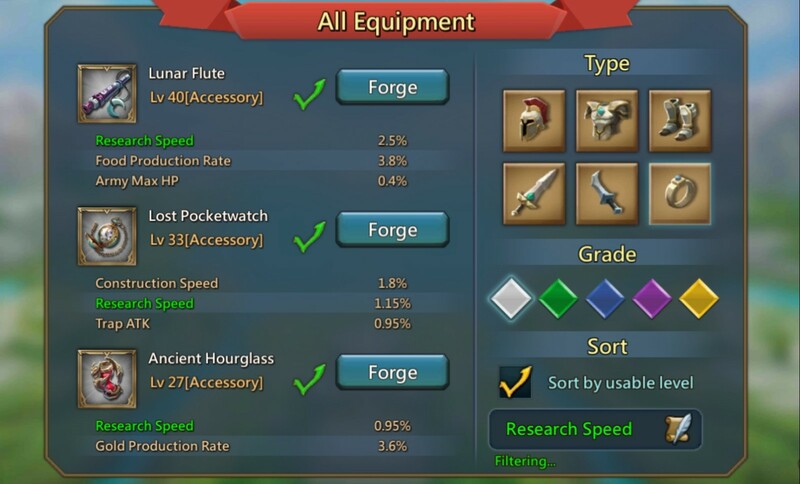 Thankfully, I heard early on to start forging any gear for level 40+. This was very helpful in saving my materials for better equipment, since players tend to reach this level quickly. However, I hadn't used the filter to see what gear would be best to forge right away, and that slowed down my growth a LOT. Having lunar flutes for research, for example, decreases wait times tremendously!! Playing around with the filter (to keep in mind which gear is desired) also helps a player target certain monsters whenever they are on the map. I have also noticed that lv2 rss tiles give the best drops for my time. I'm loathe to admit that it took me a long time to realize that playing the hero mode wasn't enough to gain more heroes; I had only nine for months. 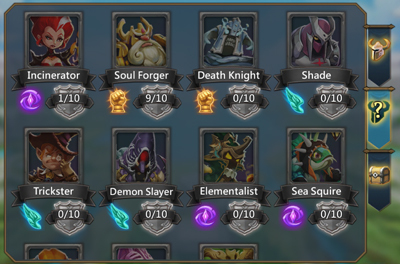 You're supposed to change tabs while viewing your heroes and sweep for medals from completed levels. For those who don't already know, sweeping for these medals is also how you upgrade your heroes to different colors/strengths: from hired as grey, to green, then blue, followed by purple and finally gold. Hiring Trickster and Rose Knight and getting them to gold A.S.A.P. should be a top priority. There are also many heroes available for purchase. Bear in mind however that this will require buying more bundles as they appear for the medals needed to level up. I honestly was not at all excited when the familiars update was released. These guys seemed to be a veritable black hole for resources, and I found them to be overwhelming at first. However, they are so helpful and dare I say vital to speeding up a player's growth. Don't be slow like I was to get started with them!! From the moment you beat Skirmish 8, you can basically start merging pacts. 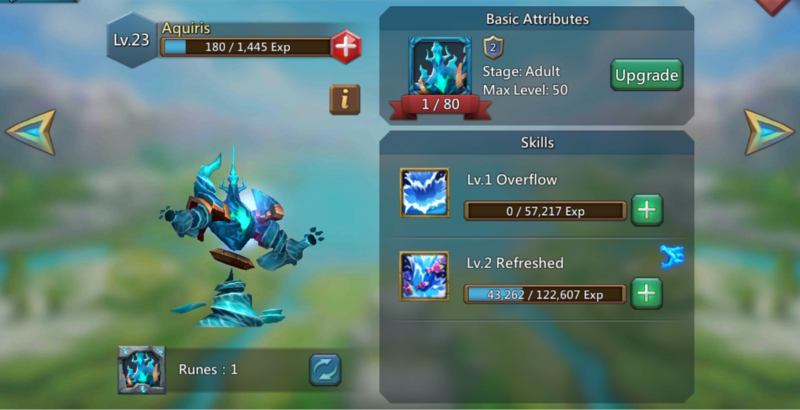 The best Familiar to max first is Aquiris–the free STA available daily will make a tremendous difference in leveling up your heroes. Harpy is also a vital choice; the VIP points are invaluable and she will also increase your shelter so you can hide more troops. From there, it really depends on what you want. 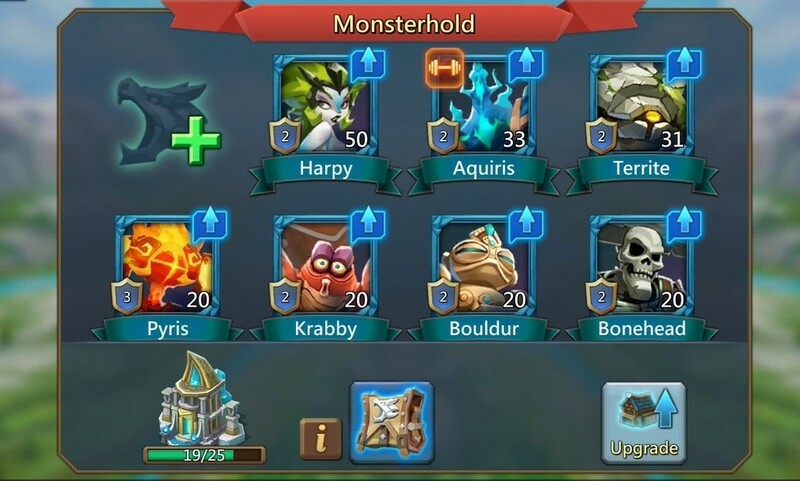 After you've gained the new familiars from each pact, you can view them in your Monsterhold. Flip through them to see which ones offer secondary skills and get to merging those pacts right away. You Don't Have to Rush Castle Level 25!! My main reason for wanting c25 was for that fifth army. I was not attentive to the hell events, however, and didn't realise how important the chance to earn Watcher medals really was. If you save all your speedups for these events, you can easily land top scores and earn great rewards in the smaller level competition pools. And while it is true that your gold becomes protected after you've maxed your vault, a c25 upgrade means you're also joining the majority of castles on a versus basis, thus making it harder to score. Another point to mention while upgrading is the change you experience at castle 17. Prior to this stage, your leader can eventually escape when captured and return to your turf. When captured beyond this level, you run the risk of having to wait for your leader to die if you cannot secure a ransom. The pros and cons of c25 can be weighed; you'll need to determine what matters to you most and go from there. These details would have been helpful for me starting out with Lords Mobile, especially as f2p. I hope that my trials can be beneficial to some of ya'll in having a better gaming experience. Thanks for reading, and please feel free to post your comments on what you've learned the hard way–after all, sharing is caring!! LOL. Cheers and happy gaming! Previous Previous post: Your turf looks! Cool!